SCOTTISH family butcher, Simon Howie, has launched a premium range of traditional ready meals to cater for the lifestyle trend towards single-person households. And unlike most ready meals, which are mass produced in a factory, the Simon Howie Foods range is prepared by chefs to more closely reflect the demands of discerning consumers. David Niblett, national sales manager at Simon Howie, said: “Our ready meals offer a generous portion for one and, due to the innovative and unconventional nature of their preparation, reflect the quality, taste and appearance of a nutritious home cooked meal. Ready meals offer an affordable alternative to eating out, and a less expensive option for consumers seeking a night off from cooking. But whereas the ready meal market has previously been dominated by spicy foods originating from overseas, such as curries, the Simon Howie range caters for a growing trend for more traditional, locally-sourced foods. 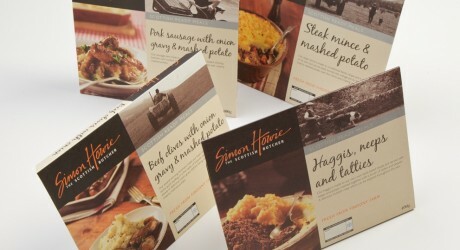 Simon Howie’s ready meals range comprises: haggis, neeps and tatties; Scottish stovies and braised cabbage; beef olives in onion gravy with mashed potato; steak mince with mashed potato and pork sausages in onion gravy with mashed potato. The full range is available in ASDA and Sainsbury’s throughout Scotland.